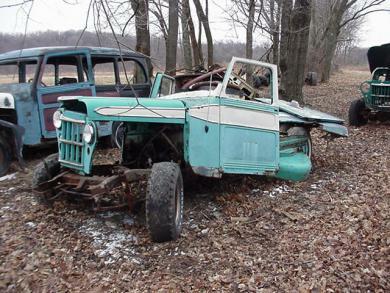 Willys / Kaiser / Jeep CJ / Wagon parts - Parts only - No complete vehicles for sale. We've listed all the larger parts that we have. If one of the large parts in the pictures isn't listed below, there's a good chance it's sold. Parting 1955 & 1960 Jeep Willys 4x4 4WD wagons; Doors $50, hood $50, grill $50, front fenders (running boards cut) $25 each, ashtray $5, gauge cluster $50, tailgate upper (split glass type) $25, glove/tool doors $15/$20, glovebox insert small tear $20, wagon rearmost side glass (teardrop-shape) $20/pane, wagon/ pu door glass $35/ pane, other small parts. Complete 4x4 wagon frame/chassis w/ axles $125. (Gear ratios? No axle tags, sorry.) 1951 Jeepster: hood, convert top frame, spare tire carrier. (SOLD: oil bath air cleaner; T90A-Dana18; 66 CJ parts truck, set of 8 interior panels, armrests, turn signals, hood ornament, spare tire carrier, windshield wiper motor, rear wagon seats, wagon 7th seat, panel delivery rear doors, lower tailgate, upper tailgates, Jeepster grill, wagon sliding side glass, 76 CJ T150-dana20 transtransfercase, rear Willys script bumper, CJ5 Western snow plow w/ Delta pump). === Parts-only, 1948wagon,1963 Maverick; 1962wagon OhioTitle VIN:58167-19302 - no VIN tag, 1981JeepCJ5 OhioTitle VIN:1jcbm85a3bt045320. 1982GrandWagon-eer OhioTitle VIN:1jcnm18n3ct053616. Both Commandos/ Jeepsters are sold. Sorry but no complete wagons / pickups or bodies; no cabs or tubs for sale - none, aucun, ninguno, keiner, nessuno, geen, nenhum, ни один, ingen, niente. Please do your own freight estimates before you ask about shipping large/heavy items. All prices exclude shipping costs.